Easier access to medical education equals more saved lives! They are coming for your dollar! No not the big oil companies or even the rising cost of fast food! This time it’s the “nation’s oldest, largest voluntary organization devoted to fighting cardiovascular diseases and stroke.” The same American Heart Association® who claims to be “the nation’s leader in CPR training” is once again presenting a more profitable educational model. Currently CPR is taught to laypersons, physicians, nurses and paramedics. Each and every healthcare provider is required to possess a CPR certification that is required to be renewed every two years. Last year, the AHA increased the cost of becoming a CPR instructor by requiring anyone interested in teaching to purchase an online Instructor’s Essentials course available only through the Heart Association in addition to all of the instructional material required to teach the course. Under current guidelines, if a hospital or ambulance service is teaching their own personnel, books can be libraried and shared among students. The American Heart Association appears to be changing over to a “blended” educational model. Instead of the cost of the course being dictated by the provider and paid to the provider, each and every student (currently released only for EMS personnel) is required to purchase and attend an online version of the course (at $24.00 per student only available through AHA vendors) where they will take the online examination (currently taken in the classroom). After paying their money and attending the online course, the student WILL STILL BE REQUIRED to attend and pay for the classroom course before receiving the required certification card. I am forced to ask the difficult question. Is continuing to increase the cost of certification really consistent with the goal of trying to educate as many people as possible in the lifesaving skills of administering CPR? I think not. 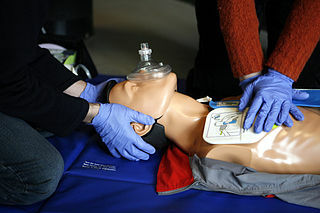 Is continuing to attempt to enforce their no competition, monopoly version of CPR education consistent with that goal? I would think not. Why would an Association who claims to have the health and welfare of people at it’s core make it more and more difficult and more and more expensive to obtain the information and the skills needed to save lives? Why would they continue to attempt to discourage other providers from offering courses imparting the same knowledge to healthcare providers? The answer seems to be a painfully obvious one. The almighty dollar has polluted the goals of yet another fine organization.